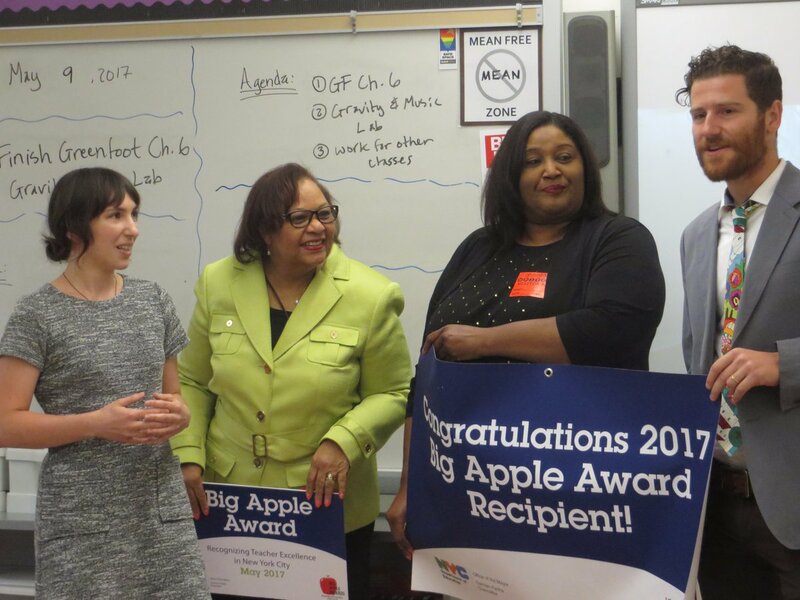 NEW YORK – Schools Chancellor Carmen Fariña announced the winners of the fifth annual Big Apple Awards, honoring 19 recipients and celebrating the incredible work of New York City public school teachers. The Big Apple Awards are a citywide recognition program open to all full-time teachers in New York City public schools and recipients were selected from a pool of over 7,800 nominations. The 19 award recipients include 17 classroom teachers, one arts educator and, for the first time, a physical education teacher. For the second year, Chancellor Fariña and Deputy Chancellors surprised teachers in their classrooms and presented them with awards. The visits allowed students and school staff to join in celebrating the outstanding work of their teachers. “I want my students to be creators – to design, innovate, and problem-solve their way to a better future,” said Ms. Cornibe. She started a robotics program and later establish an Advanced Placement Computer Science program that have ignited students’ passions and interest in learning. 73 percent of last year’s graduating class took a course in computer science, robotics, or both.